Non-residential capital and repair expenditures — N.L. Capital expenditures: Non-residential construction — N.L. Capital expenditures: Machinery and equipment — N.L. Non-residential capital and repair expenditures — P.E.I. Capital expenditures: Non-residential construction — P.E.I. Capital expenditures: Machinery and equipment — P.E.I. Non-residential capital and repair expenditures — N.S. Capital expenditures: Non-residential construction — N.S. Capital expenditures: Machinery and equipment — N.S. Non-residential capital and repair expenditures — N.B. Capital expenditures: Non-residential construction — N.B. Capital expenditures: Machinery and equipment — N.B. Non-residential capital and repair expenditures — Que. Capital expenditures: Non-residential construction — Que. Capital expenditures: Machinery and equipment — Que. Non-residential capital and repair expenditures — Ont. Capital expenditures: Non-residential construction — Ont. Capital expenditures: Machinery and equipment — Ont. Non-residential capital and repair expenditures — Man. Capital expenditures: Non-residential construction — Man. Capital expenditures: Machinery and equipment — Man. Non-residential capital and repair expenditures — Sask. Capital expenditures: Non-residential construction — Sask. Capital expenditures: Machinery and equipment — Sask. Non-residential capital and repair expenditures — Alta. Capital expenditures: Non-residential construction — Alta. Capital expenditures: Machinery and equipment — Alta. Non-residential capital and repair expenditures — B.C. 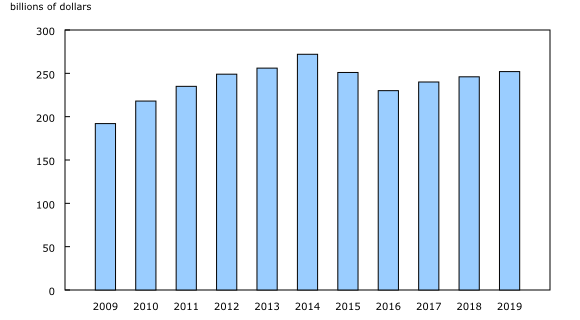 Capital expenditures: Non-residential construction — B.C. Capital expenditures: Machinery and equipment — B.C. Non-residential capital and repair expenditures — Y.T. Capital expenditures: Non-residential construction — Y.T. Capital expenditures: Machinery and equipment — Y.T. Non-residential capital and repair expenditures — N.W.T. Capital expenditures: Non-residential construction — N.W.T. Capital expenditures: Machinery and equipment — N.W.T. Non-residential capital and repair expenditures — Nvt. Capital expenditures: Non-residential construction — Nvt. Capital expenditures: Machinery and equipment — Nvt. Capital expenditures on non-residential construction and machinery and equipment are expected to rise 2.5% to $252.1 billion in 2019, following increases of 4.3% in 2017 and 2.5% in 2018. Growth was led by increases in anticipated capital outlays on construction assets, excluding housing, up 3.2% in 2019 to $164.3 billion. Higher spending on machinery and equipment is also expected (+1.2% to $87.7 billion). Growth in capital expenditures on privately held non-residential tangible assets is expected to accelerate in 2019 (+2.8%) after two years of moderate increases (+1.4% in 2017 and +0.7% in 2018). Spending on non-residential assets by public sector organizations is anticipated to increase 2.0%, following strong growth in 2018 (+5.9%). In 2019, 12 out of 20 industrial sectors plan to increase capital expenditures, compared with 13 in 2018 and 15 in 2017. The oil and gas extraction subsector represented 14.6% of capital spending intentions in Canada in 2019. Its share reached a peak of 28.0% in 2014 before declining in 2015 and 2016. Spending on non-residential tangible assets in the transportation and warehousing sector increased by 9.1% in 2018 and is expected to continue its growth this year (+12.6%), reaching a record $35.6 billion. Growth in capital spending intentions for 2019 in British Columbia (+12.9%), Ontario (+3.8%) and Quebec (+5.7%) were partially offset by declines in several provinces and territories. Most provinces and territories reported increased capital expenditures in both 2017 and 2018. The most notable exception was Newfoundland and Labrador, where major project completions were largely responsible for the declines (-17.6% in 2017 and -16.7% in 2018) over the two years. Capital investment in the transportation and warehousing sector is expected to increase 12.6% to $35.6 billion in 2019. Both private and public organization reported increased spending intentions in the sector. While the largest contributor to this growth is a 19.6% (+$1.7 billion to $10.4 billion) anticipated rise in transit and ground passenger transportation, increased capital spending is anticipated across almost all transportation subsectors. Investments intentions in the support activities for transportation industries, which include facilities such as airports, ports and harbours, as well as trucking and pipeline terminals, are expected to grow by 22.6% to $4.1 billion. Even though capital spending in the mining, quarrying, and oil and gas extraction sector has declined significantly from the record levels achieved in 2014, it is still expected to be the top sector in 2019 in terms of capital expenditures. Growth in 2019 is primarily due to increased mining and quarrying (except oil and gas) spending intentions in Saskatchewan. Capital spending in the oil and gas extraction subsector is expected to remain stable at $36.7 billion in 2019, following an 8.8% decrease in 2018. The completion of several large projects in the non-conventional oil extraction industry caused the decline in 2018, while spending in conventional oil and gas extraction was stable. Capital expenditures in the utilities sector are anticipated to increase 4.2% to $28.9 billion, due to increased investments in the water, sewage and other systems subsector (+23.7% to $6.2 billion). On the other hand, intended spending in electric power generation, transmission and distribution is down slightly (-0.8% to $20.3 billion), following a 14.1% decline in 2018 due to the completion of major projects. Manufacturers anticipate a 4.9% increase in capital spending in 2019 to $19.1 billion. Out of 21 manufacturing subsectors, 17 reported an expected increase for 2019. In the Fall Economic Statement 2018, the federal government introduced the Accelerated Investment Incentive to encourage business investment. Eligible manufacturing and processing equipment acquired after November 20, 2018, will be eligible for a full tax write-off the year it is put in use in the business. Increased spending intentions by chemical manufacturers in Alberta (+$992 million to $2.1 billion) more than offset declines in transportation equipment manufacturing (-$841 million to $2.6 billion), primarily in Ontario and Quebec. Capital spending in the public administration sector grew by 12.3% in 2018 (+$3.6 billion to $32.7 billion) after an 11.4% increase in 2017 (+$3.0 billion to $29.1 billion). In 2018, investment growth was led by provincial and territorial public administration (+$2.1 billion to $12.5 billion) as well as federal public administration (+$1.3 billion to $6.3 billion). Machinery and equipment was largely responsible for the increase in federal government assets. Conversely, the increase in provincial and territorial spending was mostly due to non-residential construction, specifically in British Columbia, Ontario and Quebec. The second largest contributor to the $6 billion increase in capital expenditures for 2018 was the manufacturing sector. Spending in this sector was 18.8% above 2017 levels (+$2.9 billion to $18.3 billion). Notable increases were reported in petroleum and coal products manufacturing (+$861 million to $2.1 billion), transportation equipment manufacturing (+$811 million to $3.4 billion), chemical manufacturing (+$686 million to $2.4 billion), primary metal manufacturing (+$514 million to $2.0 billion) and food manufacturing (+$479 million to $2.4 billion). In the transportation and warehousing sector, both private and public organizations reported an increase, contributing to growth of 9.1% to $31.6 billion. The increase was driven by investments in pipeline transportation (+13.6% to $8.9 billion), rail transportation (+31.4% to $3.5 billion), transit and ground passenger transportation (+5.7% to $8.7 billion), and support activities for transportation (+8.2% to $3.4 billion). In 2018, capital spending in educational services increased for the fifth consecutive year, as several organizations reported major projects partially funded by the federal government through the Post-Secondary Institutions Strategic Investment Fund. A 12.9% increase in capital spending to $34 billion is expected for British Columbia in 2019, following 10% growth in 2017 and a 3.8% increase in 2018. Increases are anticipated in several sectors, mainly transportation and warehousing (+35.6% to $7.6 billion), utilities (+21.0% to $4.8 billion), and public administration (+14.4% to $4.2 billion). All three sectors were also the largest contributors to the provincial increase in 2018. Capital spending in Ontario is expected to increase by 3.8% to $75.2 billion, following growth of 7.4% in 2017 and 4.9% in 2018. The utilities (+17.2% to $10.0 billion) and transportation and warehousing (+16.3% to $10.2 billion) sectors are the primary contributors to the increase. The public administration sector also indicated an increase in spending intentions in 2019 (+7.2% to $11.9 billion), as did most others. However, investments in the educational services sector is expected to decline following the completion of several projects at post-secondary institutions in 2018 (-16.4% to $4.2 billion). Manufacturers anticipate spending 10.3% less in 2019 after a sizeable increase (+18.9%) in 2018. Decreased spending intentions in the transportation equipment manufacturing (-25.3% to $2.1 billion) and primary metal manufacturing (-33.6% to $447 million) subsectors in 2019 is the main factor of the sector's outlook. In Quebec, the manufacturing sector is expected to lead growth in 2019 (+26.0% to $4.8 billion) following two years of declines. Spending in the transportation and warehousing sector is anticipated to increase by 18.6% to $5.6 billion, following a 29.7% increase in 2018. Investments in the health care and social assistance sector are expected to rise 32.6% to $2.1 billion, while intentions for the utilities sector point to an 8.5% decline to $4.4 billion as major electric power projects near completion. Overall, capital expenditures in Quebec are anticipated to reach $41.4 billion in 2019 (+5.7%), after an 8.2% increase in 2017 and a 4.2% gain in 2018. Spending in Alberta is expected to remain near $60 billion for the third year in a row. Capital spending decreases expected in the mining, quarrying, and oil and gas extraction sector (-4.0% to $27 billion) in 2019 were only partially offset by anticipated increases in the manufacturing sector (+31.5% to $3.7 billion). The Capital and Repair Expenditures Survey is based on a sample survey of 25,000 private and public organizations. The preliminary estimates for 2018 and intentions for 2019 survey was conducted from September 2018 to January 2019. Data in this release are expressed in current dollars. 34-10-0279-01: Historical (real time) releases of capital and repair expenditures, non-residential tangible assets by industry. Statistical revisions are carried out regularly in the compilation of economic and social statistics. Real-time data tables allow users to examine a given time series of economic or social data as it appeared (and was used) at a given point in time before it was revised. For more information, see Real time data tables in the Behind the data module of our website. Real time data tables 34-10-0278-01 and 34-10-0279-01 will be updated on March 7. For analytical information, or to enquire about the concepts, methods or data quality of this release, contact Lee-Anne Jennings (613-951-0606; lee-anne.jennings@canada.ca), Investment, Science and Technology Division.